RVTools is a windows .NET 2.0 application which uses the VI SDK to display information about your virtual machines and ESX hosts. Interacting with VirtualCenter 2.5, ESX Server 3.5, ESX Server 3i, VirtualCenter 4.x, ESX Server 4.x, VirtualCenter 5.0, VirtualCenter Appliance, ESX Server 5.0, VirtualCenter 5.1, ESX Server 5.1, VirtualCenter 5.5, ESX Server 5.5, VirtualCenter 6.0 and ESX Server 6.0. RVTools is able to list information about VMs, CPU, Memory, Disks, Partitions, Network, Floppy drives, CD drives, Snapshots, VMware tools, Resource pools, Clusters, ESX hosts, HBAs, Nics, Switches, Ports, Distributed Switches, Distributed Ports, Service consoles, VM Kernels, Datastores, Multipath info and health checks. With RVTools you can disconnect the cd-rom or floppy drives from the virtual machines and RVTools is able to update the VMware Tools installed inside each virtual machine to the latest version. This application supports ESX Server 3.5, VirtualCenter 2.5, ESX Server 3i, ESX Server 4i, VirtualCenter 4.x, ESX 4.x, VirtualCenter 5.0, VirtualCenter Appliance, ESX 5.0, VirtualCenter 5.1, ESX 5.1, VirtualCenter 5.5, ESX 5.5, VirtualCenter 6.0 and ESX 6.0. It's now possible to save the filter. The next time RVtools is started it will use the filter automatically. Pass-through authentication implemented. Allows you to use your logged on Windows credentials to automatically logon. All numeric columns are now formated to make it more readable. On vInfo the columns Commited, Uncommited, Shared and on vSnapshot the column size are now formated in MBs instead of bytes. New tabpage created with service console and VMKernel information. using NPOI to make it possible to write directly to xls files without the need for a installed Excel version on the system. New menu function to write all information to one excel workbook with for each tabpage a new worksheet. new command line options. Check the documentation! Bug fix! On vNic tab unhandled exception when link is down. Description in VI API Reference is excelent "The current link state of the physical network adapter. If this object is not set, then the link is down". Sorry guys this situation was not tested by me. This is fixed now. On vHost tab new fields: Vendor and model. On vHost tab new fields: Bios version and Bios release date. New vNic tab. The vNic tab displays for each physival nic on the host the following fields: Host, datacenter, cluster name, network device, driver, speed, duplex setting, mac address, PCI and wakeon switch. Layout change on vHost, vSwitch and vPort tabpages. They now all start with host name, datacenter and cluster name. The commandline function ExportAll extended with an extra optional parameter. It's now possible to specify the directory where the export files are written. On vSphere VMs in vApp where not displayed. Filter not working correct when annotations or custum fields contains null value. When NTP server(s) = null the time info fields are not displayed on the vHost tabpage. When datastore name or virtual machine name contains spaces the inconsistent foldername check was not working correct. Tools health check now only executed for running VMs. On vHost tab field "# VMs" now only powered on VMs are counted. On vHost tab field "VMs per core" now only powered on VMs are counted. On vHost tab field "vCPUs per core" now only powered on VMs are counted. On vDatastore tab field "# VMs" now only calculated for VM's which are powered on. Health check "Number of running virtual CPUs per core" now only powered on VMs are counted. Health check "Number of running VMs per datastore" now only powered on VMs are counted. During Installation there will be an application event source created for RVTools. This to fix some security related problems. Some users run into a timeout exception from the SDK Web server. The default web service timeout value is now changed to a higher value. New Health Check: Inconsistent folder names. Improved exception handling on vDisk, vSwitch and vPort tab pages. With the help of Ciaran Garvey, Benj Starratt and Shane Wendel I was able to improve the zombie file discovery. Thanks to all. Files in .snapshot directories are no longer reported as zombies. CTK files are no longer reported as zombies. The problems with VM files which are placed in the root directory are now solved. Under some condition the filter screen terminated with an exception. This is fixed now. New fields on vDisk tab: ThinProvisioned and split. New field on vTools tab: Virtual machine hardware version. 15 minutes after the release of version 2.7 I received an email from Kyle Ross who told me that RVTools was showing the cos and esxconsole VM's as zombies! This problem is now fixed! Thanks again Kyle for alerting me so soon. RVTools now reports storage which is wasted by zombie VMs, VMDKs, templates and snapshots. You can find this information on the vHealth tab page. If you guys pay me a dime for every gigabyte of wasted storage, found by RVTools, you will make me rich J. Due to the fact that the search all datastores task can take a long time to complete, RVTools now use a separate thread to collect this information. The default percentage value of "free datastore capacity" is changed from 10% to 15%. Bug fix! If a snapshot is more than two levels deep, only the first two are visible. With the input from Mike Price this problem is now solved! Thanks again Mike. RVTools is now using the vSphere 4 SDK. The SDK has been enhanced to support new features of ESX/ESXi 4.0 and vCenter Server 4.0 systems. On vNetwork tab the Vmxnet2 information is improved (due to the new SDK). 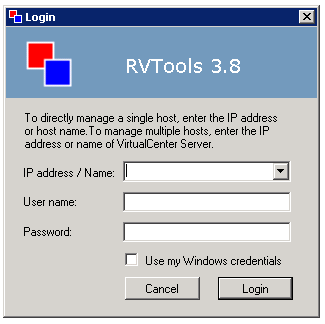 The name of the vCenter server or ESX host to which RVTools is connected is now visible in the windows title. New menu option: Export All. Which exports all the data to csv files. Export All function can also started from the command line. The output files are written to a unique directory in the users documents directory. New vSwitch tab. The vSwitch tab displays for each virtual switch the name of the switch, number of ports, free ports, promiscuous mode value, mac address changed allowed value, forged transmits allowed value, traffic shapping flag, width, peak and burst, teaming policy, reverse policy flag, notify switch value, rolling order, offload flag, TSO support flag, zero copy transmits support flag, maximum transmission unit size, host name, datacenter name and cluster name. New vPort tab. The vPort tab displays for each port the name of the port, the name of the virtual switch where the port is defined, VLAN ID, promiscuous mode value, mac address changed allowed value, forged transmits allowed value, traffic shapping flag, width, peak and burst, teaming policy, reverse policy flag, notify switch value, rolling order, offload flag, TSO support flag, zero copy transmits support flag, size, host name, datacenter name and cluster name. Filter is now also working on vHost, vSwitch and vPort tab. Health check change: number of virtual machines per core check is changed to number of virtual CPUs per core. Changed health check properties are not set at start of the program. The program will use the default values until you start and transmit the properties screen. This problem is now fixed. Since version 2.5 the vDisk tab displays information that is aggregated from "config.hardware" and "guest" information. That was not a good idea! If there is more than one partition on a virtual disk the displayed information is wrong. To solve this problem I now split this information in a vDisk tab which will show only the information that is provided by the "config.hardware" information and a new vPartition tab that will display the "guest" information. Better exception handling on filter. New fields on vHost tab: Number of CPUs, Cores per CPU and virtual CPUs per Core. Bug fix! Better exception handling on the vDisk and vNetwork tab pages. With the help from Alan Civita this problem is now solved! Thanks again Alan. The installation file now understands how to upgrade without the need to uninstall the previous version first. The documentation file is now also deployed to the program directory. You can start the Adobe reader from the RVtools "help" menu. New fields on vDisk tab: Level, Shares, SCSI Controller, Unit id and vmdk path name. I'm now using the "config.hardware" information to fill this tab page. In the previous versions of the program I was using the guest information which have a strong dependency with the VMware tools. New fields on vNetwork tab: Adapter type and Mac Address type. I'm now using the "config.hardware" information to fill this tab page. In the previous versions of the program I was using the guest information which have a strong dependency with the VMware tools. New tab! vHealth. Displays health check messages. 1. VM has a CDROM device connected! 2. VM has a Floppy device connected! 3. VM has an active snapshot! 4. VMware tools are out of date, not running or not installed! You can set your "own" health check threshold values in the "Health Check Properties" form. The new filter throws an exception when there are ESX hosts which do not belong to any cluster. With the help from Mario Vinet this problem is now solved! Thanks again Mario. On the vDatastore tab you can now see which hosts are connected to the datastore. System.InvalidCastException: Unable to cast object of type 'VimApi.NasDatastoreInfo' to type 'VimApi.VmfsDatastoreInfo' bug on vDatastore tab fixed! New vHost tab. The "vHost" tab displays for each host the name, datacenter name, cluster name, CPU model, CPU speed, number of CPU's, CPU usage %, total amount of memory, memory usage %, memory reserved for the service console, number of NIC's, number of HBA's, number of VM's running on this host and the ESX version of this host. All tab pages (except the datastore tab) now also display the datacenter name and cluster name. New VMFS "Block size", "Max Blocks", "Number of extents", "Major Version number", "Version string" and "VMFS upgradeable" fields on the vDatastore tab. New "Virtual machine version string" field on the vInfo tab page. Divide by zero bug on vDatastore tab is now fixed. The vInfo fields "upgrade policy" and "Sync.time with host" which where introduced in version 2.2 caused some problems in combination with the 2.0 version of the VI API. This is now fixed! New vDatastore tab. The "vDatastore" tab displays for each datastore the name, connectivity status, file system type, number of virtual machines on the datastore, total capacity in mb's, free capacity in mb's, multiple host access indication and the url. New menu option "export data to cvs file"
The field "OS" which is displayed on most of the tabpages now displays the name of the guest OS according to the VMware Tools. In previous versions we used the configuration value. The vTools tab displays both "OS" fields. New vInfo tab. The "vInfo" tab displays for each virtual machine the hostname of the guest, power state, power on date / time, number of cpu's, amount of memory, number of nics, configuration path, annotation, ESX host name, operating system name and VI SDK object id. New CPU tab. The "vCpu" tab displays for each virtual machine number of cpu's, max cpu, overall cpu usage, shares, reservations, limits, annotations, ESX host name and operating system name. New snapshot tab. The "vSnapshot" tab displays for each snapshot the name, description, date / time of the snapshot, quiesced value, state value, annotations, ESX host name and operating system name. The header text is automatically included after a copy and past action. This version 1.1 functionality was "lost" in version 2.0. RVTools has five new tabpages which give you information about your virtual machines. RVTools displays information about cpu, memory, disks, nics, cd-rom, floppy drives and VMware tools. With RVTools you can disconnect the cd-rom or floppy drives from the virtual machines. It's also possible to start an upgrade of the VMware Tools. You can copy the selected datagrid values with ctrl-c to the clipboard. The header text is automatically included. After this you can paste the clipboard data to your favorite editor. The login form remembers the names and/or IP addresses of the entered ESX hosts and/or VirtualCenter servers.You can use a filter to display only the "templates" or "virtual machines". Annotations "notes" field is visible in the datagrid.